Leavened bread has bubbles in it. As the bubbles rise through the bread dough, they cause the dough to rise. Gluten in the dough traps some of the bubbles. When we bake the bread, the heat stops more bubbles being formed and it sets the bubbles as the dough dries. The bubbles in bread are formed by sugar digesting yeast (Saccharomyces Cerevisiae ), tiny micro-organisms which convert some of the carbohydrates in bread flour into carbon dioxide and alcohol. We don't taste the alcohol in bread because the baking heat evaporates it away. 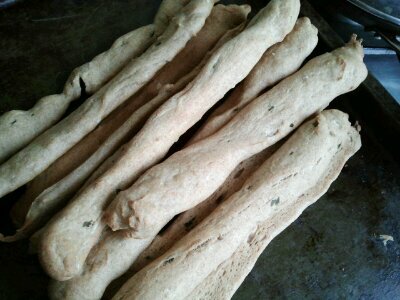 These bread sticks are chunky and have more than a hint of wild garlic about them. We love making them and eating them and hope you will too. I often make these as a way for apprentices to taste the first Wild Garlic harvest of the year. As the plants get bigger, bolder and more tasty by the day, only a few wild garlic leaves are needed for this recipe. 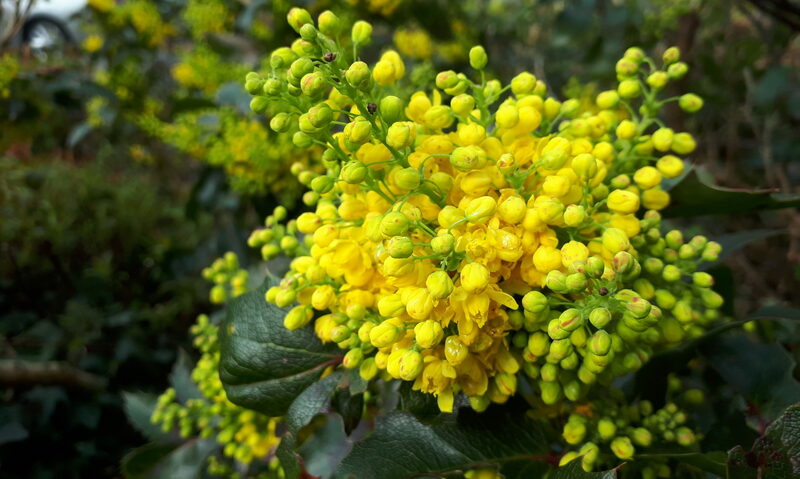 Please remember to pick carefully and to leave the plants in excellent shape, with their bulbs intact in the soil. Firstly, gather three Wild Garlic (Allium ursinum, Ramsons, NL: Daslook) leaves. Give them a quick rinse and pat them dry with a clean tea towel or similar. 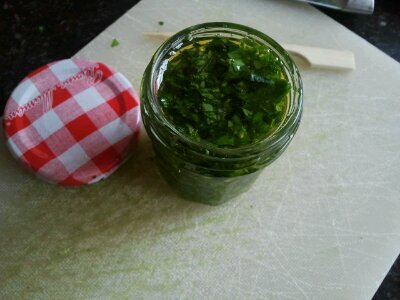 Finely chop the leaves and place them in a very small glass jam jar. Cover with extra virgin olive oil and poke around a little with a chopstick or cocktail stick, to release trapped air bubbles. Top up if necessary, to keep the leaves covered in oil. Leave your wild garlic oil to infuse, with the lid on, whilst you make the bread as follows. NB: The infused oil will be ready to use in as little as an hour but will keep at room temperature for several weeks, provided there was no water on the outside of the leaves when you chopped them. Mine never lasts that long as we eat it in everything at this time of year. When everything is well combined you need to knead it! Aim for a good ten minutes of therapeutic kneading, by which time your dough should be silky and springy to the touch. Then place your ball of dough in a glass or ceramic bowl, covered with a damp clean cloth or cling film, in a warm place, “until the dough has doubled in size”. I must say that I find that standard bread making statement of limited use. Dough “proving” is sometimes hard to gauge as the dough will change shape and texture as it rises. Mine generally mutates in a glass bowl, filling it gradually with long bubbles, rather than simply doubling up neatly. Use your judgement and common sense with this, the time needed for the first proving, will depend on your room temperature and specific ingredients. 40 to 90 minutes should do the trick but don’t worry if it doesn’t exactly seem to double in size. Now give your dough a second kneading. This will make the dough decrease a lot in size and that’s fine. This step is called “knocking back”. 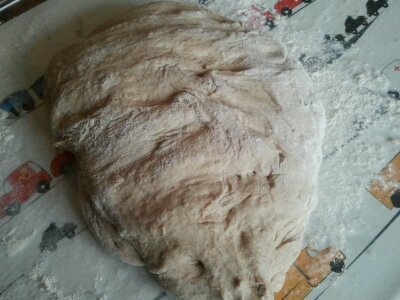 After the quick knocking back knead, cover your dough ball again and leave in a warm place to double in size, again. (Unless I am on holiday I generally use a bread machine for the kneading and proving stages of bread making (machine set to the dough setting). This recipe works equally well for bread machines and for hand working). 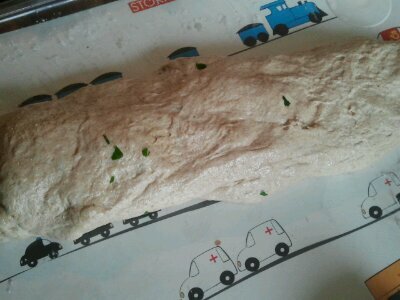 Turn out your twice risen dough, onto a floured worktop and sprinkle a little flour over the top. 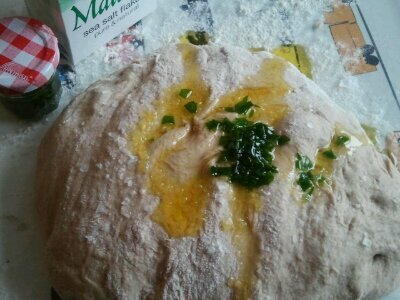 Then pour about a tablespoon or two of your wild garlic infused oil (including the leafy bits) and a teaspoon or two of Malden Sea Salt Flakes onto the dough. Work this in just a little, so that you feel that the oil and salt are throughout the dough. 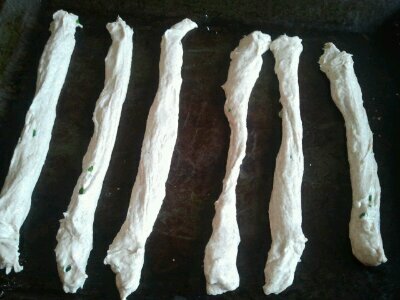 Divide the mixture into about twelve small balls and make each into a long stick shape. Or whatever shape you like. Place on an oven tray and bake at 200°C until they turn hard on the outside and light golden brown.